Ideal “bend to fit” static positioning resting hand design with a long middle strap to effectively capture the wrist with moderate to severe wrist contractures. 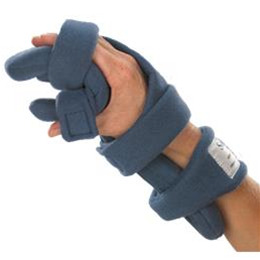 Ideal for moderate to severe wrist contractures with mild to moderate contracture of the fingers. A thumb stall correctly positions the thumb. 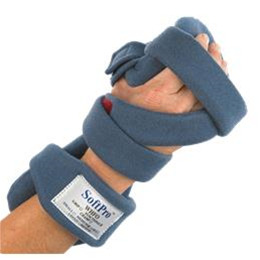 Orthotic therapy for moderate to severe contracture of the wrist, hand, and fingers and adduction of the thumb. The orthotic device is ideal for support, protection, and positioning of the wrist, hand and fingers for Rheumatoid Arthritis or for progressive extension restorative orthotic therapy of the wrist, hand and fingers. Treats moderate contractures of the wrist, hand and fingers. Child	SP 31FFR-C (left or right)	1 3/4" - 2" 7"
Youth SP 31FFR-Y (left or right) 2" - 2 1/2" 8"
Small	SP 31FFR-S (left or right)	2 1/2" - 3" 9"
Medium SP 31FFR-M (left or right) 3" - 3 1/2" 10"
Large SP 31FFR-L (left or right) 3 1/2" - 4"	11"